A lucky couple (or two climbing partners) will soon be attempting a summit of Grand Teton for free, with expenses paid by Rock/Creek, Marmot, and Exum Guides. The giveaway is hosted online at Rock/Creek's outdoor gear store. I can say for sure that the winner of this promotion will have a fantastic experience, and make memories of a lifetime. Leading specialty outdoor apparel and gear retailer Rock/Creek announces a new travel giveaway for a 4-day Grand Teton climb for two with Exum Guides and Marmot. The trip includes 2 days of climbing school and a 2-day summit attempt on the Grand. The lucky pair will also win 6 nights at the American Alpine Club climber’s ranch, airfare for two to Jackson Hole Wyoming, a rental car and some Marmot gear. The Grand Teton makes it onto countless climbers' bucket list, and is one of the classics of North American alpinism. Exum Guides helps hundreds of climbers summit ever summer, and many of those have no previous climbing knowledge before the two-day climbing school. The winner could be an experienced climber or a passionate beginner. All they have to do is show up fit and ready. Entrants need to submit a 2-minute video to enter, and the sponsors will be choosing a winner from these video entries. The video theme: Why should we choose you to win the Grand Teton dream climb? Interested adventurers can started at rockcreek.com. 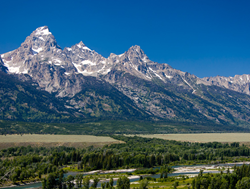 Daydreamers can get started thinking about their trip by using RootsRated to research Jackson Hole, Wyoming. RootsRated is a locally-vetted website answering the question "What to do outside?" Rock/Creek is an independently-owned specialty outdoor retailer based in Chattanooga, Tennessee. With 25 years of brick-and-mortar experience, the retailer offers only the very best o utdoor apparel and equipment from top brands like Marmot, Horny Toad, prAna, Salomon and Chaco.